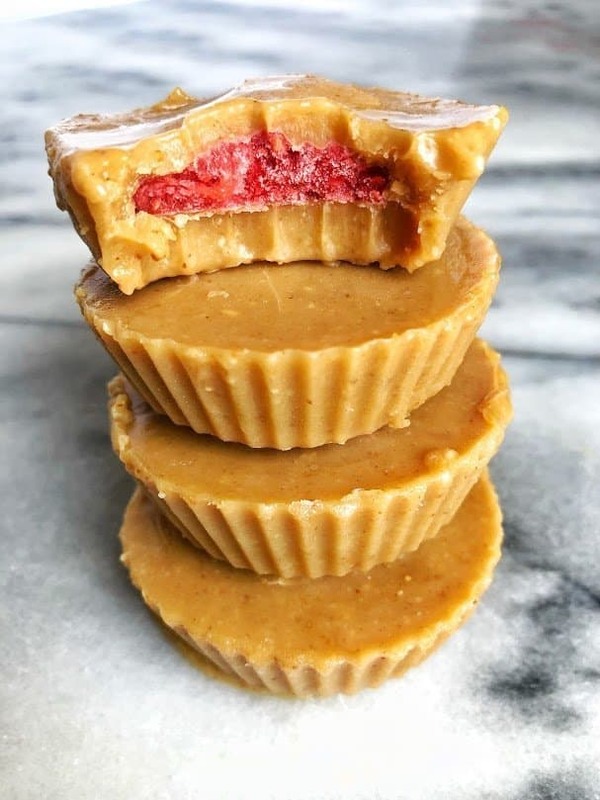 Healthier Peanut Butter and Jelly Cups are a twist on the childhood favorite, made with a creamy peanut butter outside and a sweet strawberry jelly inside! They are a perfect healthy dessert and made with only five ingredients. It’s peanut butter and jelly time friends. Except in cup form, and a WHOLE heck of a lot better. These little fudgy cups are an actual dream and immediately brought me back to my childhood. I made a batch of them last week after toying with the idea for a while, I had this perfect vision of pb&j cups and the whole entire time I kept wanting to say inside out peanut butter and jelly cups, which I really don’t know why because they aren’t inside out. When I went to work on the blog post for these I typed “inside out peanut butter and jelly cups” – I’m not sure what my issue is, but maybe I should just name them that. Anyway, they are made with only five ingredients that you probably already have in your pantry. The hardest part is easily waiting for them to freeze. Easily the hardest. If you’re looking for a sweet treat so have during the summer months, these peanut butter and jelly cups are perfect for you! 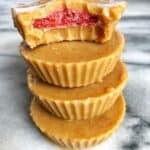 Peanut Butter and Jelly Cups are a twist on the childhood favorite, made with a creamy peanut butter outside and a sweet strawberry jelly inside! They are a perfect healthy dessert and made with only five ingredients. Add coconut oil and maple syrup and stir until combined. Turn off heat. Pour 1 tbsp of peanut butter mixture in molds. Place in freezer. In separate saucepan, add strawberries and a splash of water. Simmer on medium-low heat. Once soft enough, mash with fork, turn off heat, and add in chia seeds. Place strawberry mixture in fridge for 10 minutes. 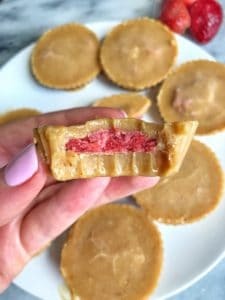 After chilled, place one teaspoon of strawberry mixture on center frozen peanut butter cups. Add another tablespoon of peanut butter onto top of strawberry mixture and place in freezer. Let freeze at least one hour before eating. How do you make them into that cup shape?